HOMEMAKERS was launched in March 2019 through a merge between HOMEMAKERSfair and Renovate. HOMEMAKERS is South Africa’s largest direct-response home improvement, home services, home decor and home appliances magazine. We distribute over 990 000 magazines across South Africa bi-monthly. HOMEMAKERS helps you find an expert in your area through our comprehensive advertising directory and provides relevant information and inspiration through relevant editorial content. HOMEMAKERS continues the legacy of being an unbeatable resource for consumers for over 30 years, providing the best home-improvement products, services and advice in South Africa. Discerning homeowners deserve a product that can assist them in making informed decisions on their home lifestyle and improvement projects. 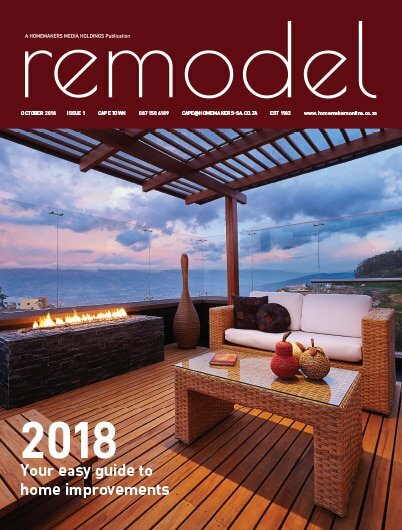 The annual Remodel magazine offers exactly that, as carefully curated publication, it uses display ads and informative editorial to ensure that the most popular home improvement categories are covered. Circulated throughout Gauteng, remodel promises to be a valueable, comprehensive guide and source of inspiration for aspiring homeowners all-year-round.